Instead, what we found was a space not unlike a small wood, except it runs alongside a rather busy boulevard so we could hear all the passing traffic instead of, say, songs of the birds. 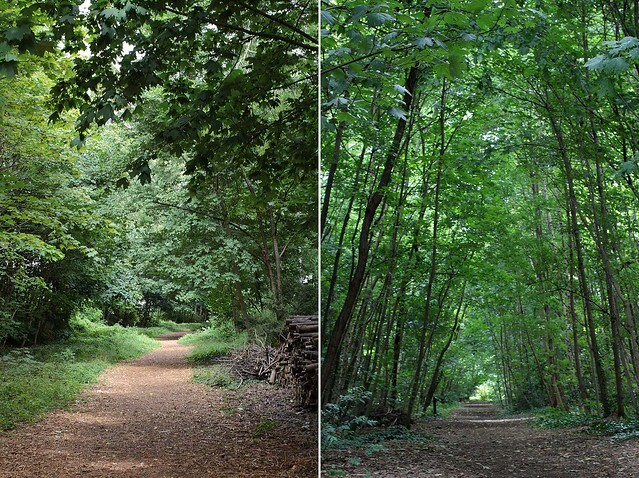 Nonetheless, it was still a rather pleasant area to walk in, with rare occasional joggers and walkers passing by – definitely a hidden corner of Paris. Our only complaint: it was way too short. We were barely started with the walk and it was coming to and end! 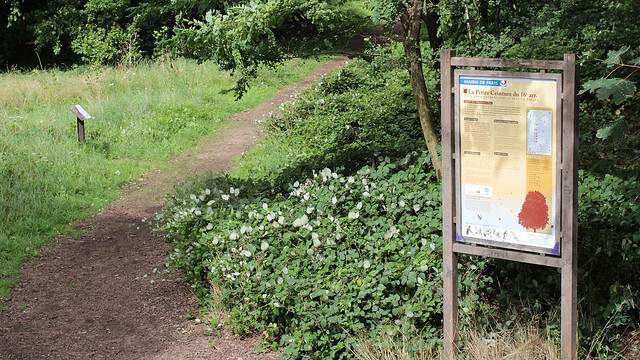 According to my Paris map booklet, the trail should have continued for a couple more hundred meters. Sure, that’s not a very long extension, but every little green space counts, right? Sadly, this stretch between the exit at Boulevard Montmorency and Porte d’Auteuil is now a private area, with some kind of ongoing construction works. 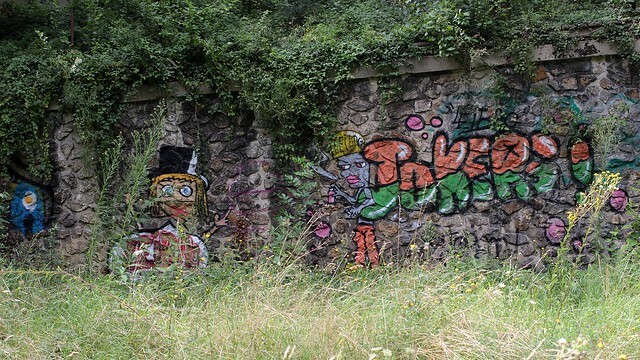 This was also the moment where it dawned on me that there will never be a full circuit of La Petite Ceinture to be resurrected in the future, no matter how romantic that notion could be. Well, what’s next? Since we were out, we might as well look around the neighbourhood as we made our way towards Maison de Radio France before heading home. 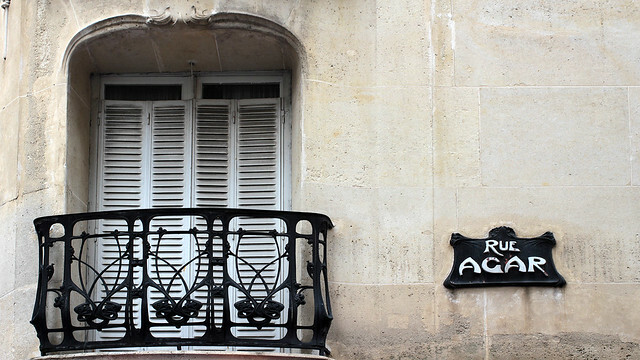 We primarily ambled along rue Jean de la Fontaine, named after the famed fabulist that every French child knows about and allegedly, these children could recite at least one of his fables by heart. Methinks I should try to look for one of his fable books to read? The stretch of our path between Porte d’Auteuil and rue de la Fontaine was not particularly remarkable, but with a little curious peering, we spotted a hidden road off rue Poussin that comes with its own guard house. Through the grille, we could see interesting houses and garden, and I debated approaching the security guard for permission to go in for a quick look. I chickened out. Continuing into rue de la Fontaine while photographing random things, F began to tell me more about this famous man when I identified an unmistakeable Art Nouveau façade. 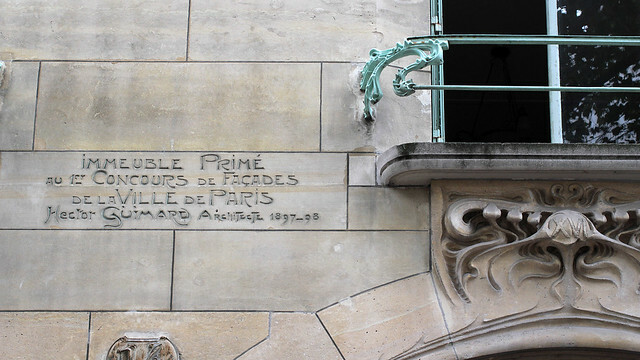 I was of course all excited to read the name Guimard engraved into the wall of Hôtel Mezzara at number 60, while F was puzzled at the significance of the name until I linked it to the famous designer of many entrances to Paris métro. 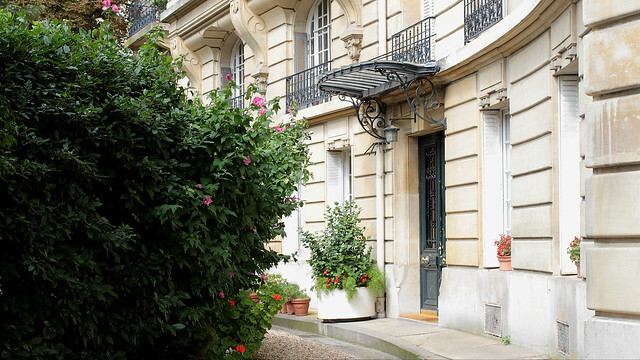 I’ve since learned that this hôtel particulier was featured in the film Chéri, starring Michelle Pfeiffer, as the residence of her character. 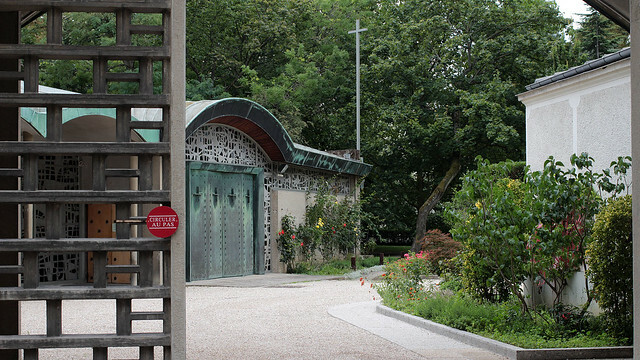 Moving along, at 40 rue de la Fontaine, a nondescript gate opens into a small park and a chapel that one could easily miss if he/she is not paying attention. 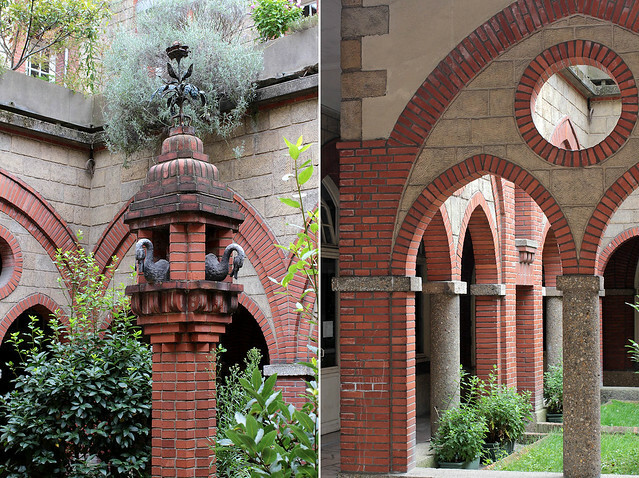 Our decision to check the chapel out was a good one, for as soon as we walked into the compound, we caught sight of a hidden cloister to the left, with arches and pillars in red bricks and a fountain in its center. 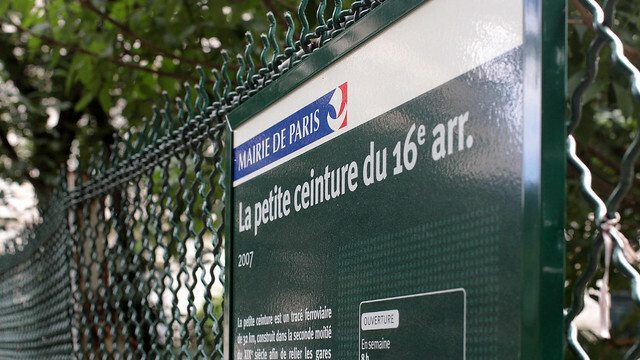 We also learned that this compound is the seat of the Fondation des Orphelins Apprentis d’Auteuil. 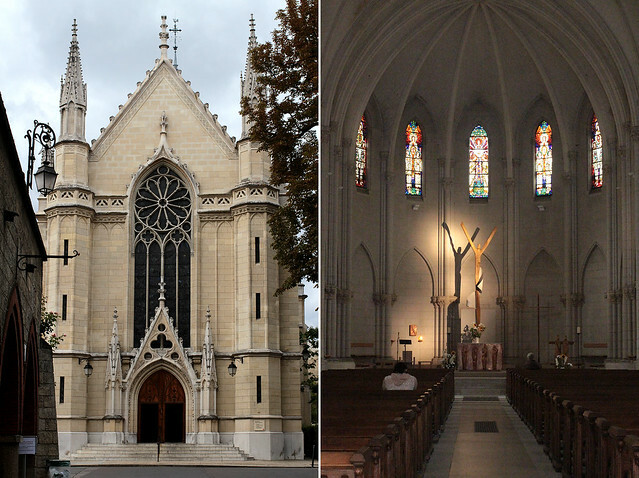 The symmetrical chapel, built in Neo-Gothic style inspired by the Sainte Chapelle, is dedicated to Saint Theresa. 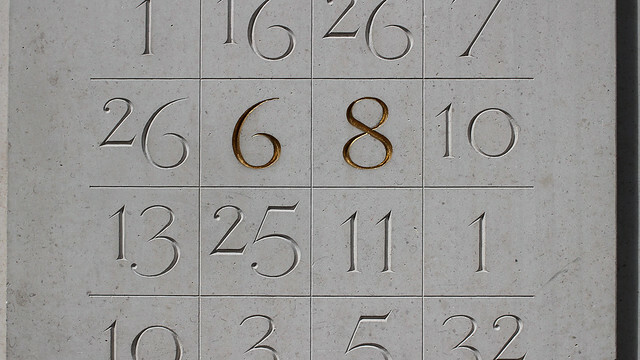 A sculpture of her is aptly placed at the centre of the oak doors sculpted by apprentices of the foundation. 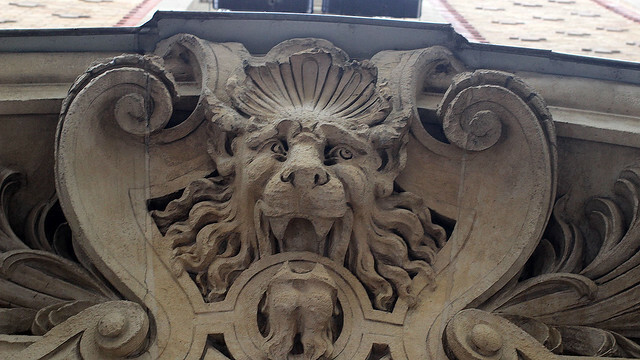 Along the sides, the gargoyles are keeping an eye on its well-being. 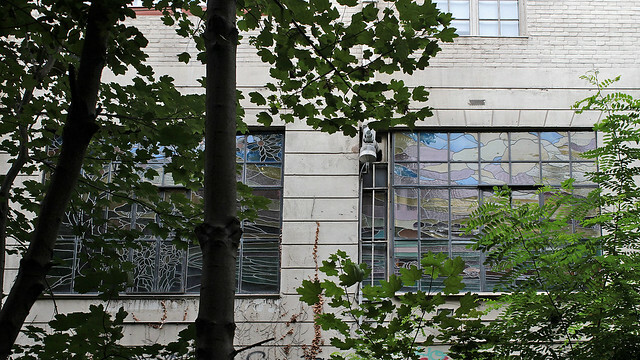 Inside, stunning stained windows made by glass masters of Mauméjean adorned the otherwise rather minimalist structure. 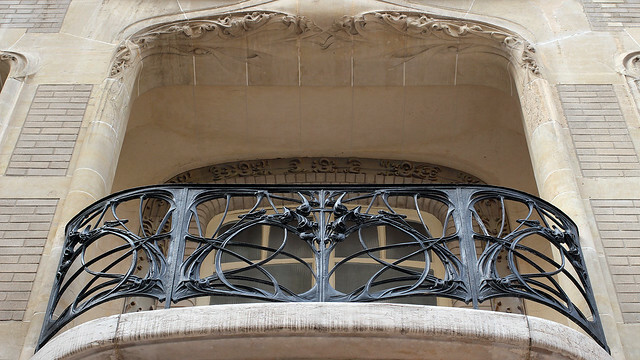 As we approached the north end of rue de la Fontaine, we noticed several more buildings signed off by Guimard. 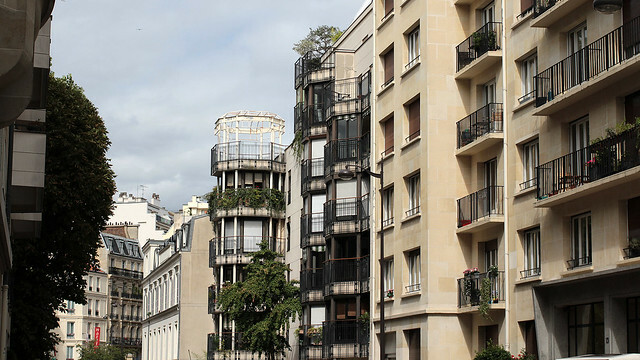 We even reckoned rue Agar (off rue de la Fontaine) could be renamed rue Guimard, given most of the buildings on this small, angular street bore distinctive symmetrical floral motifs and wavy curves. But these pale in the shadow of Castel Béranger, Guimard’s first solo commission which brought him name recognition and put him in demand. 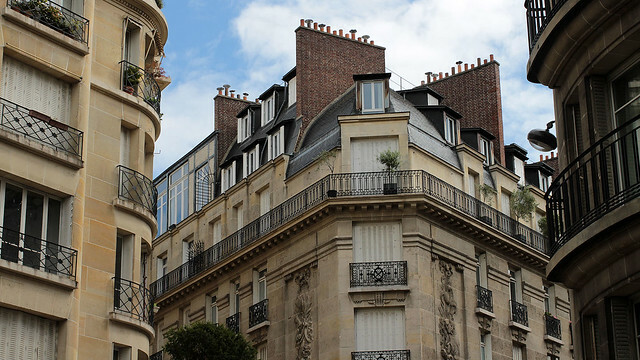 Situated on 14 rue de la Fontaine, Castel Béranger caught attention for winning an award in the very first edition of Concours de façades de la ville de Paris, albeit it was also controversially hailed as the work of a madman. 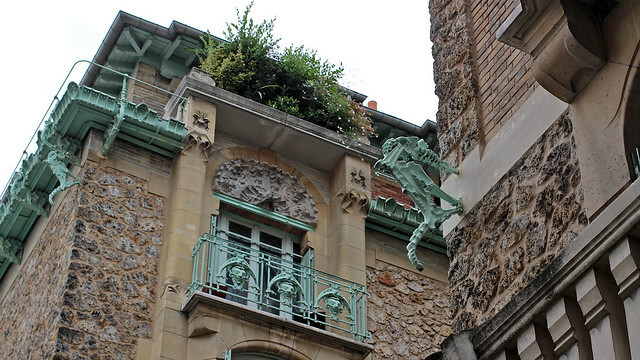 Fantasy balconies, slope-aligned windows, and weird seahorses are among the features of this building. I’m curious to see more of the interiors, but sadly, I don’t yet have a way to access them. Jardin de Ranelagh? Is there a Dublin connection? I’m intrigued! 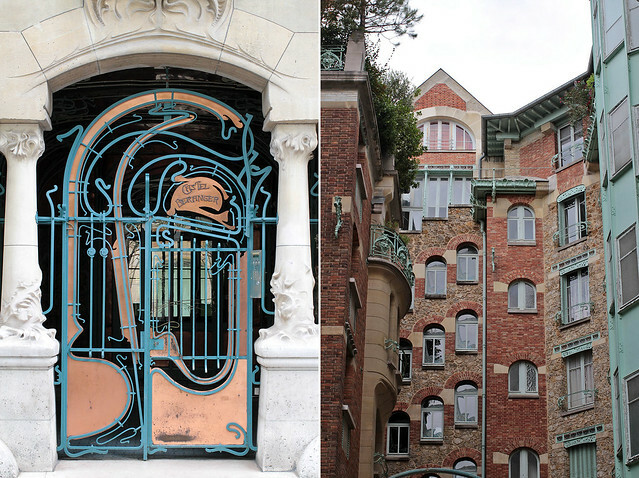 I love the Art Nouveau style of those railings! Ever so detail in both pics and text lil ;) nice walk!!! Kinda starting to feel the photos looking pretty much the same in style etc. Need to learn to push the envelope more and get nicer ones! No luck with de la fontaine, but got some Baudelaire and Rimbaud!